This is the geology along that route. 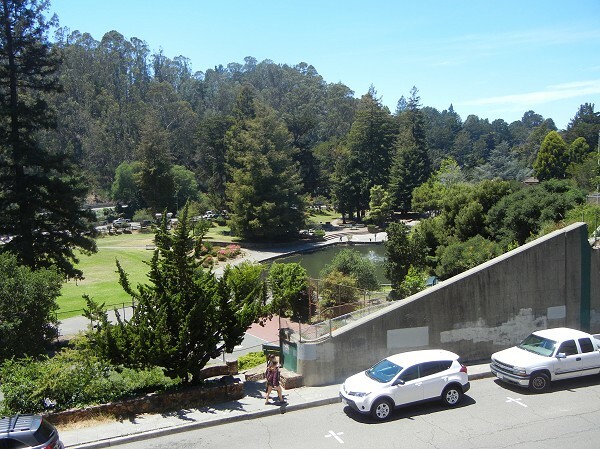 The starting point, where we climbed up to the unpaved start of the Montclair Railroad Trail, offers a nice view over the valley of the Hayward fault, here at Montclair Playground . . .
. . . and looking northwest up the fault valley. 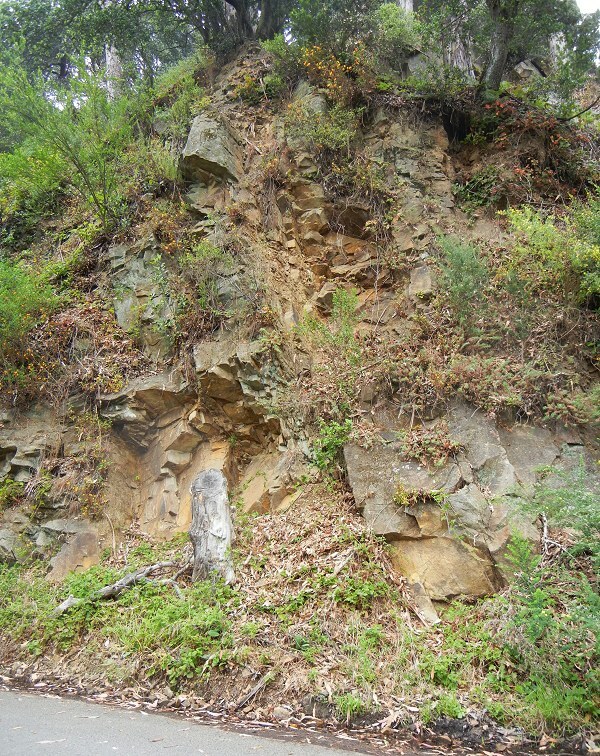 This outcrop, above the curved cut in the railbed, shows the Oakland Conglomerate to advantage. 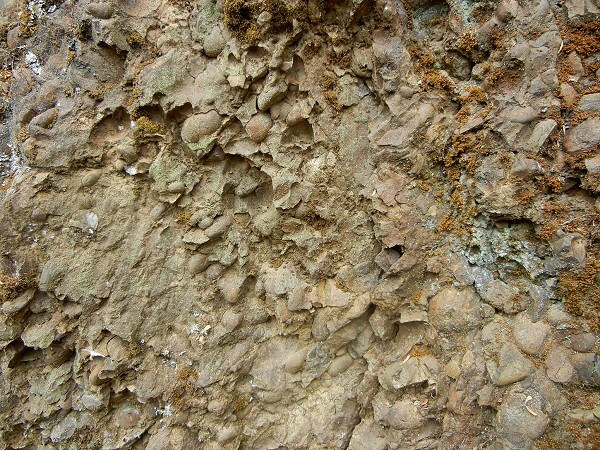 And maybe 100 feet away, the rock abruptly changes to shale of the Shephard Creek Formation. This spot corresponds to the symbol on the geologic map with the number “73” on it, which means that the bedding here is tilted 73 degrees from the horizontal. 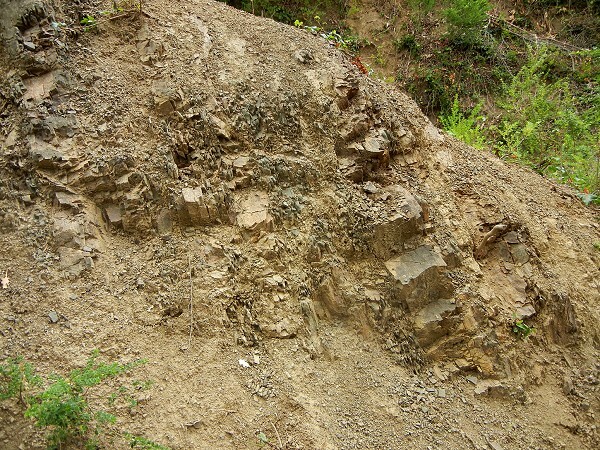 Farther up the valley, we examined this outcrop of the Redwood Canyon Formation. 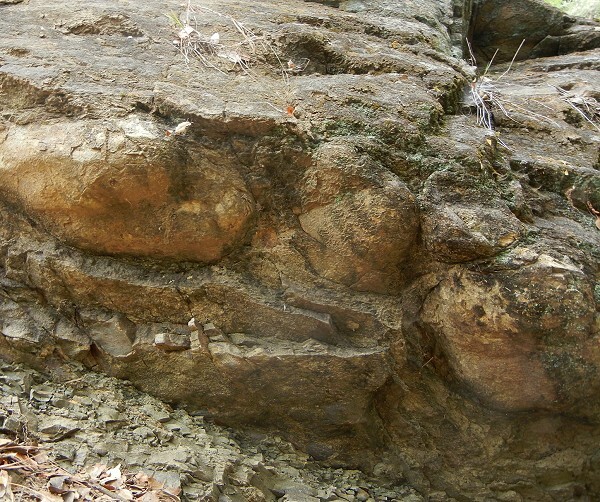 I pointed out the thin set of shale beds running up the center of the image and showed how the sandstone beds on the left side had been laid down on top of the shale—that is, the internal evidence shows that this whole set of rocks here is tilted up beyond vertical and is upside-down. 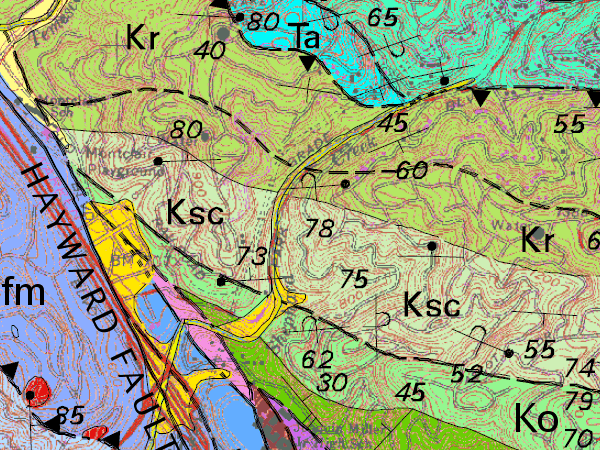 This spot corresponds to the symbol on the geologic map labeled “78”. 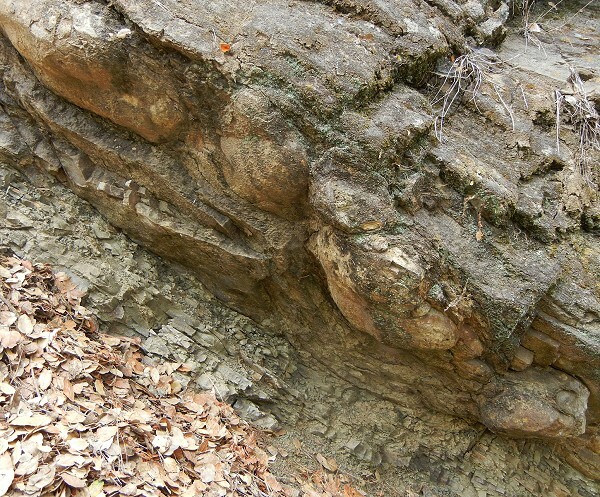 The last spot is in the Shephard Creek Formation where a large sandstone bed sits amid the shale. The location is just about where the word “Park” is along the walk route. On the underside of that sandstone bed is a splendid set of sole marks. This shot shows how the underlying shale is bent by the pressure of the overflowing sand avalanche that built this sandstone bed. And this shot looks up at the underside. When there are a sufficient number of these marks, the geologist can work out what direction the avalanche flowed. 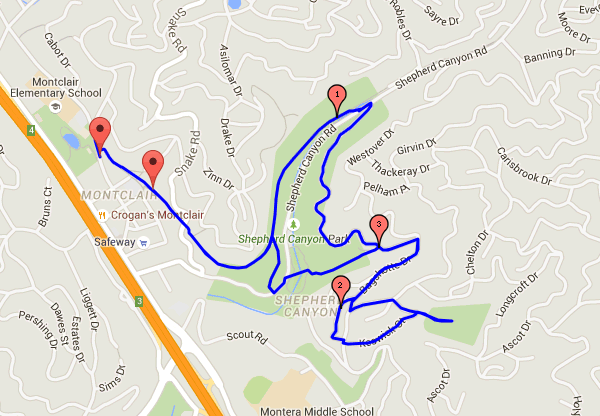 As I said, we cut the walk short at this point and came down through Shepherd Canyon Park along this stream valley, which is filled with a peculiarly flat deposit that I strongly believe is landfill. 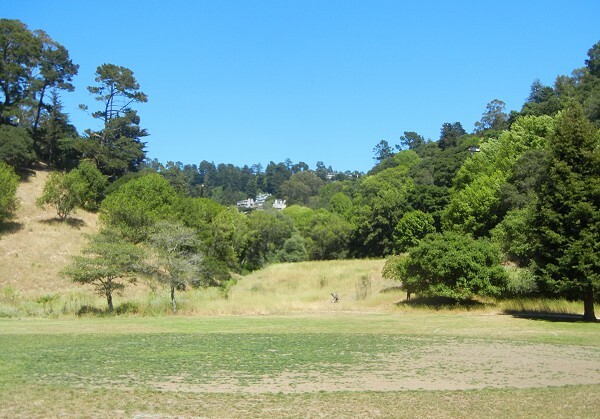 It forms the higher terrace in this view looking back from the soccer field. Does anyone know the history of this piece of land? If anyone would like a copy of the handout I prepared, I’ll send you the doc file. Just write to geology at andrew-alden dotcom. This entry was posted on 29 June 2015 at 8:02 am and is filed under Oakland conglomerate, Oakland geology walks, Oakland rocks. You can follow any responses to this entry through the RSS 2.0 feed. You can skip to the end and leave a response. Pinging is currently not allowed. I have heard the upper part of Shepard Canyon park (last picture in the series above) used to be a city dump up until the 1950s or so. I’ve always surmised that the tunnel diggings and regarding needed for the railway were the reason that fill exists. It may have obviated the need for an additional trestle there as well. I only guessing, but I’ve seen it before. Is the flat area the former right of way of Shepherd Canyon Road and the old Park Boulevard before the road was realigned for the never-built freeway? Google listed it as an old city dump site. The old Park Boulevard stub and Southwaite Drive intersected there as late as 1959, if this planning map can be believed. Mike Migurski’s Old Oakland maps show Southwaite having been cut back to Escher Drive by 1967. Thanks for these old maps, Eric. The upper terrace in the park is where Southwaite once ran. The Park Boulevard stub must have been where the soccer pitch is now. Interesting how the city expanded over the traces of its old wastelandslandfills and quarry pitsand turned them into civic assets. I wish that all those paths in the plans had been put in. Shepherd Creek once ran through the middle of what is now the soccer field. The creek was culverted and has an out fall below the fire house. 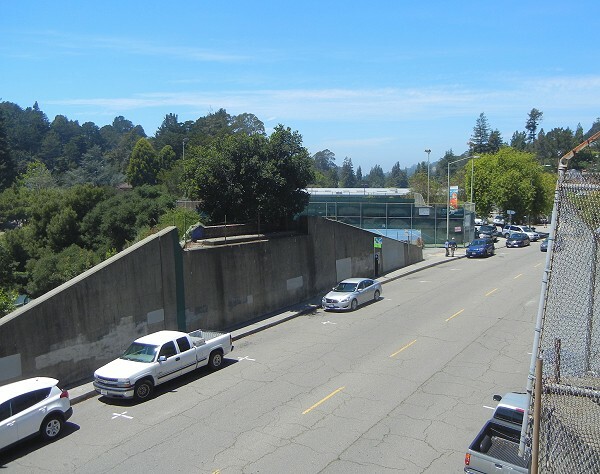 The City did use the space above the culvert for a dump and also further filled it in with dead eucalyptus trees after the big freeze in the early 1970’s.The City continued using it as a dump until a suit was filed around 1975 for the city to cease & desist. You can still see some evidence of the dumping near the fire gate at 5879 Escher Drive. The City was supposed to clean up the dumping. They didn’t and this area become a magnet for household dumping. A neighbor in the area hectored the city to do something. So in the early 2000’s the City came in with seven trucks and a skip loader and spent seven days clearing out most of the mess. In the following years, Earth Days were devoted to cleaning out an ephemeral creek which flows down from the intersection of Escher Drive & Westover Drive to join Shepherd Creek. Today I found an aerial photo of the little valley that was filled in by the city, at the East Bay Hills Project site, the tenth image in the series. It’s dated 22 April 1960 and shows the valley in pristine condition. A shame it’s gone.